Do you guys want to fly? Do you crave the open air, the skies above Zandalar and Kul Tiras? Well, if you do, you probably won’t be able to do so right away once Battle for Azeroth launches. But once again the heroic dataminers over at Wowhead have found that there may well be flight coming to the next expansion, thanks to this new detail. Just as Legion had Broken Isles Pathfinder, the upcoming expansion has a new Pathfinder achievement for the upcoming continents. It’s noted that the achievement itself seems to state that you have to do both the Horde and Alliance requirements, but that might well be a bug. If it weren’t, you’d have to level both a Horde and Alliance character through the Battle for Azeroth zones to gain the achievement. 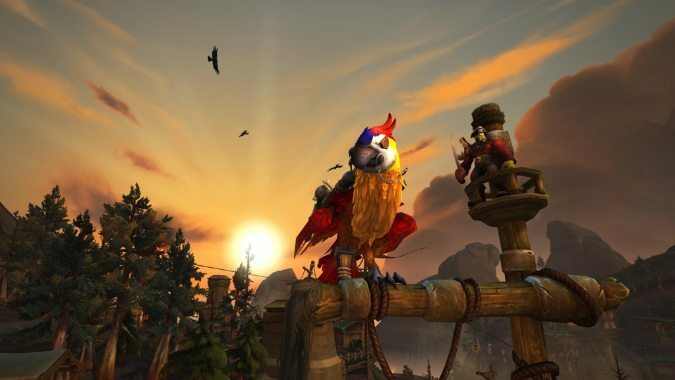 Just as Broken Isles Pathfinder Part One increased mounted speed on the Broken Isles, this new achievement — Battle for Azeroth Pathfinder, Part One — grants an increase to mounted speed on Kul Tiras and Zandalar Isle, and in order to achieve it you have to complete a series of achievements. The first one, Battle for Azeroth Explorer, is a pretty standard exploration of the new zones. Horde will complete Zandalar Forever! which means completing the storylines for the three Horde zones of Zuldazar, Nazmir, and Vol’dun as well as a special Zandalar Forever! scenario and the Bargain of Blood questline. Alliance have a similar achievement called A Nation United but, as it lacks the scenario and quest, it may not be complete yet. You’ll also have to complete Kul Tiras or Zandalar Diplomat, earning Revered with all of the faction reputations available on the Battle for Azeroth zones. No word yet on when we’ll know how to achieve Part Two, and when/if that’ll grant us flying on Kul Tiras and Zandalar Isle. But it seems the groundwork for flying is being laid in the new expansion.